DuctSox Fabric (Textile) Ducting, which is a complete Fabric Air Dispersion System, is an attractive and cost effective alternative to conventional metal ductwork. They are constructed of fabric and shaped as cylindrical tubes, similar to spiral metal ductwork. DuctSox are used to distribute and diffuse heated, cooled, refrigerated and make-up air. 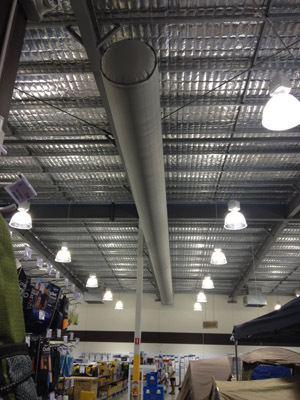 Our fabric duct systems are a cost effective, aesthetically attractive alternative to metal ductwork. In open ceiling architecture, traditional metal duct systems discharge air through side mounted metal diffusers usually spaced 3 to 4.5m apart. The air is directed to specific zones resulting in less efficient mixing of air in the occupied space and often causing drafting and hot or cold spots. DuctSox strives to be the leader in the industry through a commitment to quality, service, and innovation.DuctSox products are used to distribute and disperse air in both Open and Finished Ceiling Architecture. Different than conventional metal ductwork, DuctSox products are engineered and manufactured for each project. Designs can be simple, straight systems or very intricate layouts which incorporate fittings such as radius elbows, Ts, and transitions. Sections are zippered together to form extended lengths with diameters from 200mm – 1,525mm. Whether industrial, retail, education, commercial, government, warehousing, laboratory, food processing, temporary or permanent, DuctSox offers a proven choice. This means less ductwork! 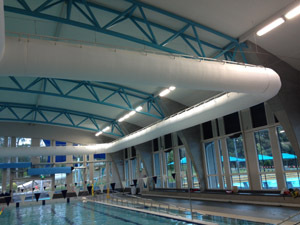 Because the entire DuctSox System is a diffuser, air can be supplied to the occupied space in a more efficient pattern. The cost of a DuctSox System is 20 to 80% less than metal. There is also considerable savings in the labor time required to install DuctSox versus a comparable metal system – up to 10 times more labour (man hours) to install metal. The weight of a DuctSox System can be significantly less than a comparable metal system. Designing with DuctSox means lighter roof loads, ease of handling, and reduced need for power lifting equipment. DuctSox HVAC systems are fabric air dispersion systems well suited for many applications. Our fabric HVAC ducts have been installed in schools, offices, restaurants, pools, retail stores, warehouses and health clubs. DuctSox commercial HVAC ducts are also installed in critical environment settings such as laboratories, commercial kitchens and food processing facilities. Open ceiling, flush mount and under floor solutions are available. See the Application Specific Brochures in the Related Downloads section below. DuctSox Corporation, headquartered in Peosta, Iowa, is a manufacturer of commercial and industrial fabric air dispersion products for open ceiling architecture, critical environments, and under floor applications. Our fabric systems are a cost effective, aesthetically attractive alternative to metal ductwork and diffusers. They are easy to install, have low material waste on the jobsite, and offer many other Green advantages.